What are the Fortnite week 2 challenges? Here are the latest Fortnite challenges and how to complete them for more XP and Battle Star goodness. Epic Games’ battle royale mode is in its second week, and that means a new round of objectives for the Battle Pass: the Fortnite week 2 challenges. Things are a little different this season, and we’ve got the lowdown on the latest Fortnite season 5 challenges. Rather than a separate set of free Fortnite challenges and tasks for those that stump up the V-Bucks for the Battle Pass, there are three free challenges each week and four for Battle Pass owners. There are still three hard challenges for ten Battle Stars each, but those without a Pass can have a crack at one of these, with the other two restricted to the premium progression system. For more on Epic’s battle royale phenomenon, check out our top Fortnite tips to help you nab a victory royale. If you have a Battle Pass or are playing for free, we’re here to help you complete the Fortnite week 2 challenges. Note, you can still complete the Fortnite season 5 week 1 challenges, and don’t forget your Fortnite Road Trip week 2 secret Battle Star when you’re all done, either. Here are the Fortnite season 5 week 2 challenges. Assault rifles are one of the most common types in the game, so you shouldn’t have too much trouble with this Fortnite week 2 challenge. You don’t even need to get any kills, either – just deal 1000HP of damage and you’re golden. The small green ammo boxes are easy to miss; they don’t exactly stand out like gold chests do. They are typically found near gold chests and inside buildings, so be sure to keep an eye out. Find seven in one match and this one is all yours. The brand new location of Paradise Palms that was introduced to the game as part of Fortnite season 5 is your killing zone this week. At the centre of the desert biome that has replaced Moisty Mire in the map’s south-eastern corner, try to find a long-range weapon to pick off enemies from the top of the high-rise building at the edge of the area. For this Fortnite challenge, you’ll need to score a basket on different hoops. But you’ll need to find them all first, and be level 11 in the season 5 Battle Pass. Loot Lake is a tricky area to which Fortnite fans have long wanted an update. You’re going to need seven Loot Lake chests for this Fortnite week 2 challenge, and other players are going to easily spot you for miles around. That said, there is loads of, er, loot, so, with some persistence, this one should be very doable. 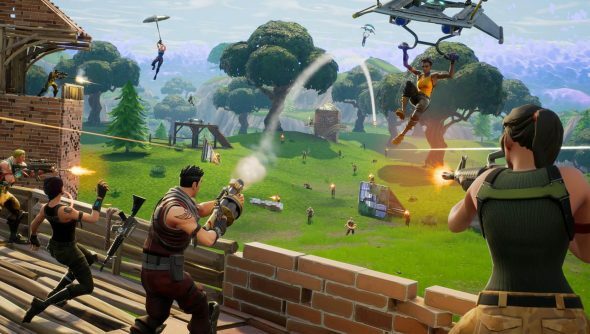 This Fortnite week 2 challenge takes you to the arid new desert biome that was once Moisty Mire. Here’s how to find the solution to the Fortnite week 2 search between challenge. This time, you only need to get two weapon eliminations rather than the usual three. This makes this ten battle star task quite a bit easier, so all you need to do is get some unfortunate foes in your crosshairs and you’ve got ten stars in the bag.